How can I create or edit a translation list from the Student Zone? 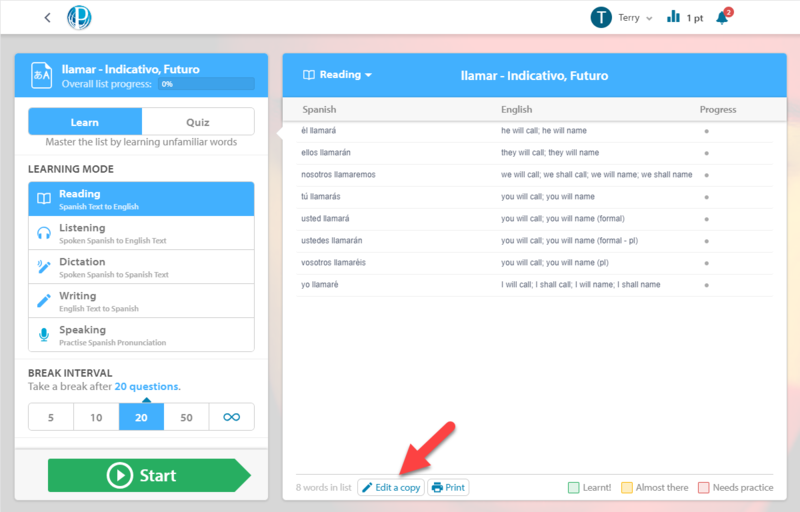 Students can create and edit Translation Lists through their Content Browser. From your Home Page, select the appropriate subject. Then, select the Browse all content button from the Subject Overview page and navigate to the folder you would like to create the lesson in. You are also able to use the search function to find the appropriate lesson or folder. Once you've navigated to the appropriate folder, select Create List to make a new list from scratch. Any lists you create will be placed within this folder, so it is important to take note of the location of the folder in order to be able to easily find it again. To edit a copy of an existing lesson, enter the list you would like to be edited from your chosen folder or by searching in the search bar at the top of the window. From here, select the Edit a copy button to be taken to a screen that allows you to add and remove vocabulary from a duplicate of this list. You will not be able to edit the ~All Content~ list, as this is automatically generated from all other lists. Simply click on the words or phrases that you want in your new list, and select Add or the Enter key to add them. To remove something from the list, click it and select Remove or the Delete key. You can also select multiple pieces of vocabulary to add or remove by pressing the Shift key. To change the name of your list, select Rename and select Done to confirm. Any Translation List you have created will appear at the top of the folder you selected in an area titled My Lists. If you would like your list approved for use in competitions you will need to send the list through to us to review. This is to ensure that it meets our standards for earning points (you can check these rules here as well by visiting our website here). If you would like to share your lists with other students, these will also need to be approved by a member of the Education Perfect Team. Once the list has been approved you, can share the 'list-starter' URL from your Student Zone. All requests for approval can be sent through to support@educationperfect.com.